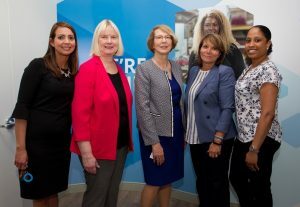 PROVIDENCE, RI (July 6, 2018) – BankNewport celebrated the opening of its first Providence branch at 55 Dorrance Street with an official ribbon cutting ceremony held June 26. BankNewport President and CEO, Sandra Pattie and Executive Vice President, Mary Leach presided over the ceremony with City of Providence Mayor Jorge Elorza, Providence City Council President David Salvatore, BankNewport Board Chairman Peter Capodilupo, Bank board members and special guests in attendance. In honor of the ribbon cutting celebration President Pattie presented $1,000 donations to three beneficiaries in support of the youth and families that they serve – Meeting Street, Year Up, and the Roger Williams University School of Continuing Studies Student Food Pantry. The new 2,000 square foot state-of-the-art, full service branch at Dorrance Street features an open lobby floor plan. The traditional teller counter has been replaced with POD stations for customer seating during transactions. Secured cash recyclers have replaced traditional teller cash drawers. The branch has image-enabled Personal Teller Machines (PTMs) providing extended hours for banker support, along with a night depository. The Dorrance Street location brings BankNewport’s branch total to 16. Highly trained universal bankers will assist customers with traditional banking transactions, as well as consumer loan originations, residential mortgages, commercial lending, business banking referrals, cash management, merchant services, online banking and mobile banking services. Staff includes a bilingual residential mortgage loan officer and a business development officer. For more information about BankNewport’s Dorrance Street branch contact (401) 401.228.8242 or visit www.banknewport.com. Lobby hours are Monday through Wednesday from 8 am to 5pm, Thursday and Friday from 8am to 6pm, and Saturday from 9 am to 1 pm. Appointments can also be made with branch bankers by scheduling a convenient time online. About BankNewport: Founded in 1819 and headquartered in Newport, BankNewport offers a full suite of loan and deposit products and services for families and businesses throughout Rhode Island. In addition, OceanPoint Insurance Agency, Inc., a subsidiary of BankNewport, offers a broad range of property casualty insurance products and a full array of financial services. With 16 banking offices and $1.5 billion in assets, BankNewport is one of the oldest community banks in the United States and, as a mutual organization, is committed to the financial success of its customers, employees and communities.